There are hundreds of amazing games for the Super Famicom that remain a mystery to Western gamers. 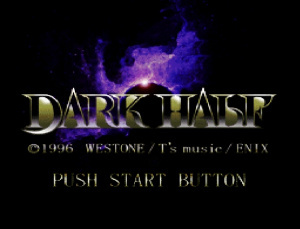 Dark Half is one such game, published by Enix in 1996. 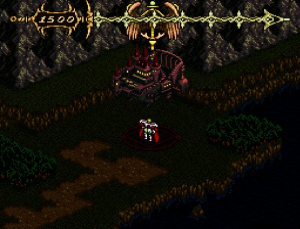 It is a late generation Super Famicom title that at first glance seems to be your typical JRPG, with the player taking control of Falco, the Paladin (not to be confused with the cocky Star Fox mercenary) in his quest to prevent an ancient evil from once again roaming the land - in short, a pretty standard RPG plot. However, play it past the first few minutes and Dark Half reveals that is anything but standard. After Falco spectacularly fails his quest in the prologue, the Demon King reincarnates in the character Rukyu. This is where the game starts to set itself apart, because it drops Rukyu in the hands of the player to control. In each of the game's chapters you get to control both Rukyu in his evil deeds followed by Falco (who just so happens to be channeling the spirit of the noble god Roda, Rukyu's nemesis), with the hero having to deal with the predictable bloody aftermath. Make no mistake, this was never meant to be a child-friendly offering; Rukyu will not simply enter a village to rest at the Inn and save his game after browsing the local Item Shop for the latest goods. He will instead enter the village to indiscriminately kill each and every villager he can find, including helpless women and children. Let that one sink in for a while: a Super Nintendo RPG that expects you to kill villager NPCs as an integral part of the story. Indeed, there was no way back in 1996 this game would ever be considered for release anywhere outside of Japan, since you are essentially the Devil going about killing innocent people. The only saving grace from a conceptual standpoint is that after the evil is done, you get to right a few wrongs as the Paladin good guy, but that doesn't detract from the fact that blood is very much on the player's hands, as they are controlling Rukyu during his murderous onslaught. Both characters suffer from what could be referred to as Gauntlet disease: their Soul Points are constantly dropping and if either of them reaches zero, it's curtains for the tale. 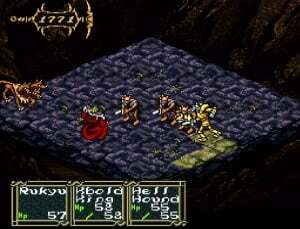 Both sides play rather differently, reinforcing the unique two-in-one style RPG approach even more. Rukyu can both control beasts and learn spells from them, replenishing his Soul Points by the aforementioned murder of innocents. On the other hand, Falco does what is expected from a Paladin: fight evil monsters, equip armour and weapons, hire mercenaries to form a party and all the expected tropes of a virtuous character. Nobody levels up in this game, so not unlike Capcom's sublime Monster Hunter series, growth comes from preparation and learning new tricks for your characters. Despite the fact that none of them really speaks much, the story is driven by the various NPCs that accompany you. Rukyu will get regular updates from his servants while Falco will get the plot from his family, friends and travel companions. It's an excellent way to drive the story. 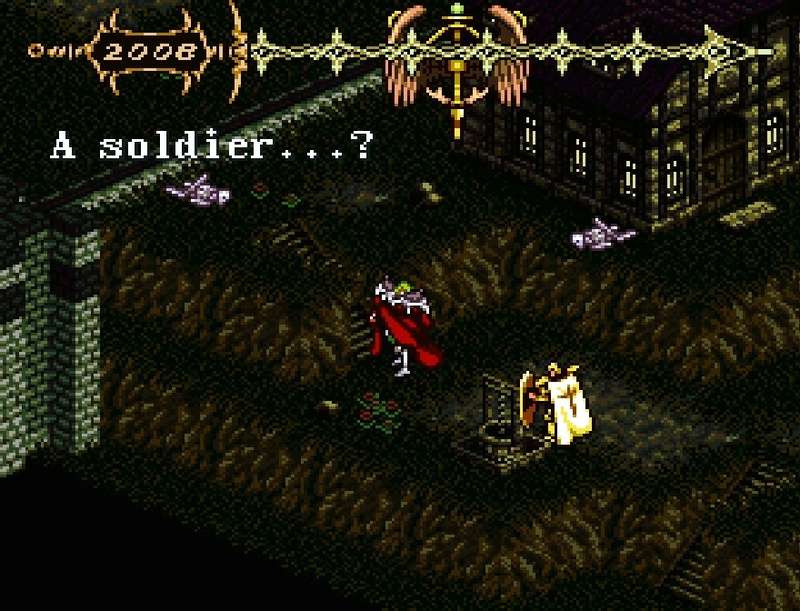 The entire game is presented via an isometric view, not much different from Landstalker on the Mega Drive / Genesis. The locations and environments really shine, but the characters are slightly blocky and are not very strongly animated. At least they are varied, with lots of neat little details to them. 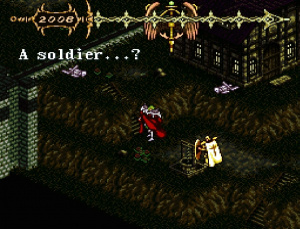 The combat system opts for a turn-based approach, which takes place on a separate isometric battlefield. The music composition is excellent, with composers Takeshi Sato and Takashi Tsumaki transmitting Rukyu's evil intent by means of oppressive church organ pieces, or quieter themes while you're walking about in the villages. 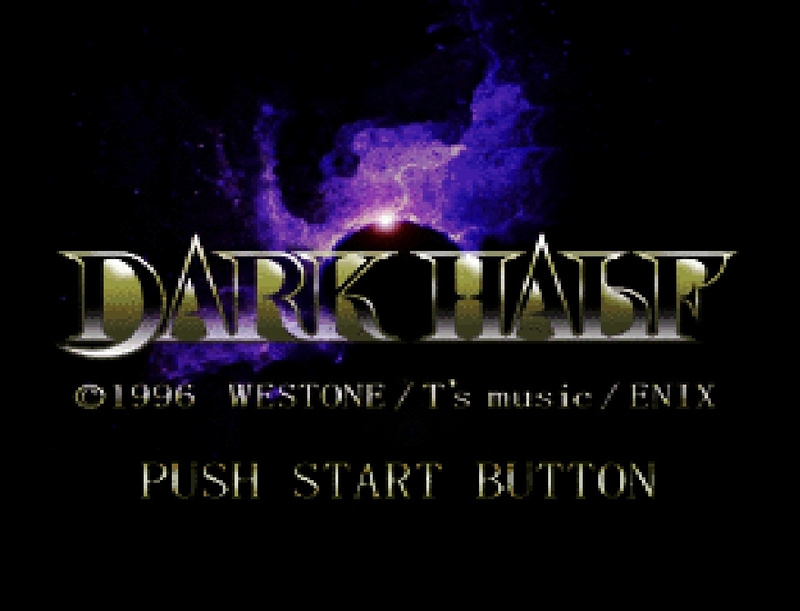 In terms of presentation Dark Half is arguably quite disappointing for a game released in 1996, yet it can hardly be described as ugly. 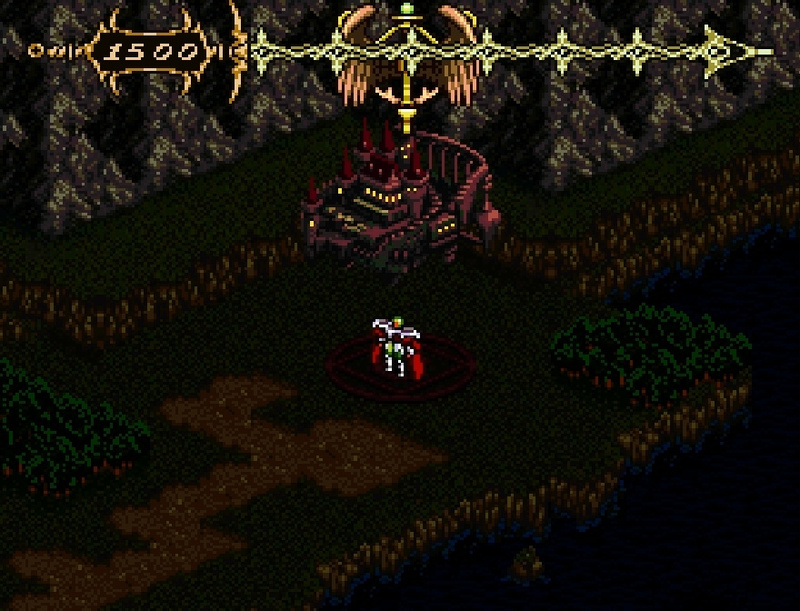 Dark Half easily ticks all the checkboxes we come to expect when looking at late-generation Super Famicom titles, with the exception perhaps of the graphics, which feel a little dated. This is mitigated by a clever premise that affords plenty of replayability value; you cannot explore everything in the world in a single playthrough, as the Soul Point depletion system simply won't allow it. This means repeated plays are required to "learn" the game and see all of its secrets. Also, in an extreme case of "You have to be cruel to be kind", the best possible ending can only be achieved if you kill the most innocents with Rukyu as possible so that Falco can retrieve more of their Soul Stones during his turn. 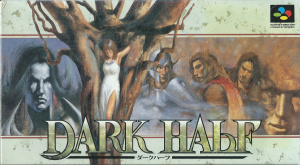 Dark Half is one of many hidden gems of the Super Famicom's later years that remained out of reach for non- Japanese-fluent gamers until AGTP Translations released the complete English translation patch. It is by far the most leftfield production from Westone - famous for the more upbeat Wonder Boy series - and we have yet to see a game explore the duality of good and evil with as much class as this one manages to do. If you're seeking a JRPG with a dark and gritty adult theme, look no further. 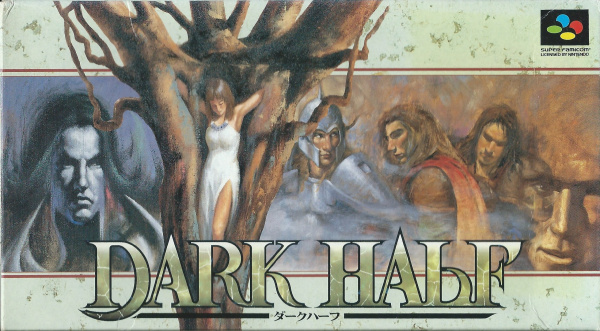 Dark Half is unique, made during a time where it was becoming increasingly hard to choose from the multitude of "me too" RPGs on the Super Famicom, and as such even in its homeland it was unfairly overlooked. Correct that lapse by tracking down a copy of this game and loading it into your RetroN 5 or Retro Freak, since both support soft-patching of cartridges. Just make sure you are perfectly clear on the point that this is not a story of happy feelings and colourful worlds, like many JRPGs on the system. Ahh yes, before Enix was Squared. Damn I gotta find a repro of this game. My life won't be complete without it. Ultima got away with slaughtering children, people skinned and nailed to a wall with pitchfork and 100% summoning of the Satan among other things. And it was few years prior. What doomed this game were pretty mediocre sales in Japan and it didn't help that it got released like month before N64 hit Japan. It was like releasing anything month or two prior to GTA5 - everybody lost. Many games faded into obscurity because of that, but some emerged in semi-popularity thanks to emu. @Dave24 And that's where I plan to be, shinning a light at all of these hidden gems that had circumstances been different would have probably have done quite well in the West... if not for the price, censorshis, etc. PS: Ah, "Ultima VII"... good times! @Shiryu then all I have to say is keep up the good work. Someone must preserve/save the games from being completely forgotten. Sadly, this game was too late to the party - if it got released in '94, it could totally nail it and be in hall of fame with FF and other Chrono Triggers. It's sometimes scary what huge impact time has for release of the game. Could nail it, because the sad thruth is, it could me completely misunderstood like Earthbound back in the day. I wish they would release this on the E-Shop as I would totally buy it! It looks like it has a really cool premise! This sounds so awesome, I can't believe I've never heard of it. WOW! Hard to believe Nintendo would allow a game like this on their console. 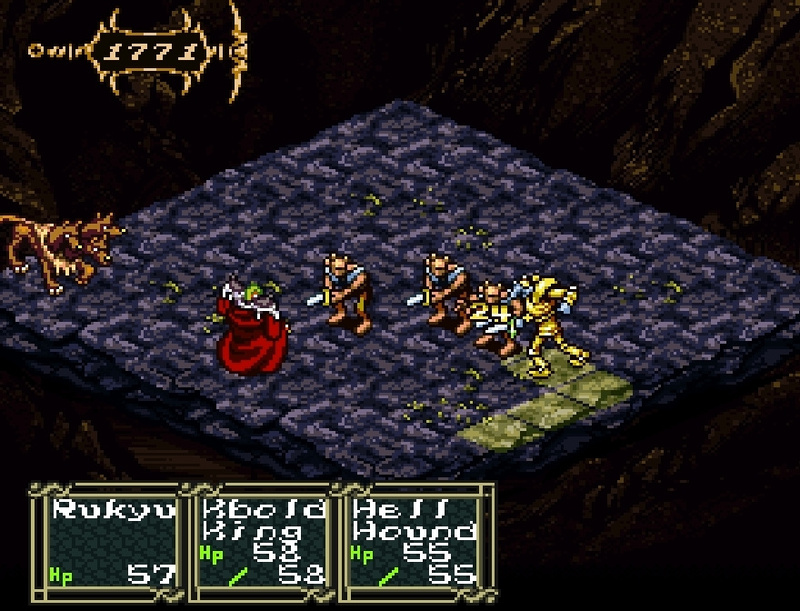 Out of all the 16-Bit RPGs I've seen, I'd say the only one that's even more violent than this is Xak 3. Same here, Thought it was on the e-shop for a quick second and got excited. Too bad you have to play as the good guy. @SetupDisk I don't know why it's a problem - you can end the game the "bad" way. The choice is up to you. That "switch" character mechanic is actually cool. It's not BS like in some games when you are forced to play as 2 characters making it busy work. Actually, being simplistic here, you could say it is kinda like Dr Jekyll and Mr Hyde, although it has more RPG aspects to it. Wow... the SNES continues to surprise me lol. I LOVED pure Enix, and I'd be interested to know who developed this as it sounds like something Quintet would've developed. Great plot... it'd be great to get my hands on this game. Never heard of this game for sure and I heard of a ton of SNES hidden gems. I guess I'll try this out after I get done with Nohr. This definitely looks intriguing. It's probably a stretch that it'll make it onto the VC, unfortunately. DamnI, thought you were giving me something exciting on Wii U virtual console for once this gen.
Never knew this game even existed, and I though I was familiar with all of Enix's SNES games. Makes me want to go play Actraiser. I have to wonder how much it would cost companies to translate and put these games on the eShop in the west. I assume there is a market for it. Or at least it would interest me. I remember hearing about this. Looks cool! @clvr Because (as stated in the review) it just got an English fan translation. And we've always reviewed retro stuff as and when we've felt like it - we don't need an excuse to cover old games. Never even heard of this. Might give it a wee look. @GraveLordXD I got my game complete in the box for 9 €uros at eBay straight from Japan. The shiping fees were as expesnive as the game itself, but well worth it. @MeloMan Indeed, it did remind me like a lot like something out of the Quintet! But no, this one was made by Westone of "Wonderboy" fame. It's written int he review . @clvr We are raising awareness of such titles that never seen the light of day in the West, namely game that have been translated to English by fans such as this one who was translated just last year. @BigBabyPeach Like anime, video games in Japan were not only targeted at children like in the west. There are many mature games on SNES that would have never fly over here in the West, this being one of them. Great review! I never heard of this game prior... seems perfect for a modern remake, I think. @EmmatheBest It's called 'Xak III: The Eternal Recurrence', a PC Engine game that was never released here; there are fan translations for it though. @GraveLordXD No, I do not own any repros. This is the original Japanese game, I also don't know enough to fully understand the game. Don't go into this without the English patch! Hey, I remembered Shiryu talking about that game (on youtube I think)! It just seems really good. I'm happy and surprised to still see new interesting games on the snes. @Shiryu That was a crazy good read, friend. Had never even heard of it before, but I will find this game and play it before the year is out thanks to this review. ..good review..thanks for the info..checkin it out now...very cool ..."I have awoken".."Until next time..."
This game sounds very cool...now if someone on Etsy could put the rom on an SNES cart, with the English patch, I'd pick it up in a heartbeat! I loathe these holier than thou types. The world can do without them just fine. May. They guy at 4:51 (The Dijnn) is either taking a dump or "moving" to some sort of Brazilian dance or something. @Shiryu Huh? Sorry my friend, but I'm trying to figure out to what comment of mine you were responding... ??? @TheRealThanos The one you sent Kirk, It was also my video on that news post. I made sure to show the village massacre this time around. @TheRealThanos My hyperactive mind sometimes omits important words such as "Now that you mention that news post,"
I was way more occupied being amused by the idiot that got stomped out in the comments section by several other members. @TheRealThanos ... what an age to be alive. @Shiryu Indeed, I think it is kind of nice to have consciously witnessed almost the entire console era as it happened (as opposed to say, people experiencing a SNES 5 or 10 years after the date), from our first humble Pong machine played on a black & white portable TV to the current generation and I will probably also live to see (unforeseen accidents aside) the end of the console as we know it, since the coming generation probably will be the last (traditional) one. @TheRealThanos "We're the old men, Ace." @Shiryu Yup, old(er) and admittedly also still very surprised myself at how much I still like playing games and talking about them. When I was a lot younger, I thought I would be "all grown up" by now (car, wife, kids, dog and what not) and never play games again because I would "probably" grow over it, as so many other hobbies, but no. @TheRealThanos I've always found grow ups and adult life in general to be rather pathetic, even as a id to be honest. I think I will stick with what I know. @Shiryu Of course it has certainly helped that the general perception of gaming has changed a lot since the eighties. Back then it was mostly seen as weird or strange by parents, and now it is the parents themselves that are gaming with their kids, so it is more accepted in society to play games, even when you're older. @TheRealThanos My 65 year old dad defies logic after I bought him a PS3 three years ago and a PS4 last year. Now he only plays racing games, all the time. I didn't know you did reviews. how awesome! I played. This game have cool ideas but is not good like it makes look. Is a 6 in score, 7 in max, in my opinion. Really, it dont is good, guys. At least I hope you have played Terranigma. Is the best game from Enix in snes. Other very very good snes game never released in west is Clock Tower. Best terror game of all time.